You know, it wouldn’t be a Google I/O keynote without some kind of talk about Maps. Larry Page and company have made it very clear that its mapping technology is a big part of its future. And they gave us a bit of a glimpse of that future today. In addition to iPad support, the Maps app will be receiving several improvements, including more prominent Zagat reviews (think Yelp), and a cross-platform 5-star rating system. It’ll also show Google Offer discounts from participating locations. Google says that the new Maps app will be available for iOS and Android this summer. But for the folks who can’t wait to try out some of the new features, you can sign up to receive an invitation to preview the desktop version. After being kicked from iOS, Google Maps was released as a standalone iPhone app last fall. It landed amidst a flurry of complaints from users about the inaccuracy of Apple’s mapping software, helping it to over 10 million downloads in 2 days. 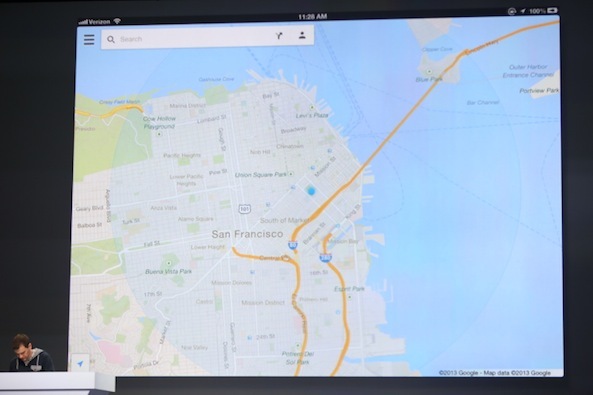 So, who’s excited about Google Maps for iPad?